Hello, hello! Long time, no see! Sorry for the radio silence around here lately my lovelies, those winter fairs have been all time consuming... a lot of fun, but a ridiculous amount of work too! Back to today though, which is a fabulous and exciting day as today I have yet another wee interview to share with you all. 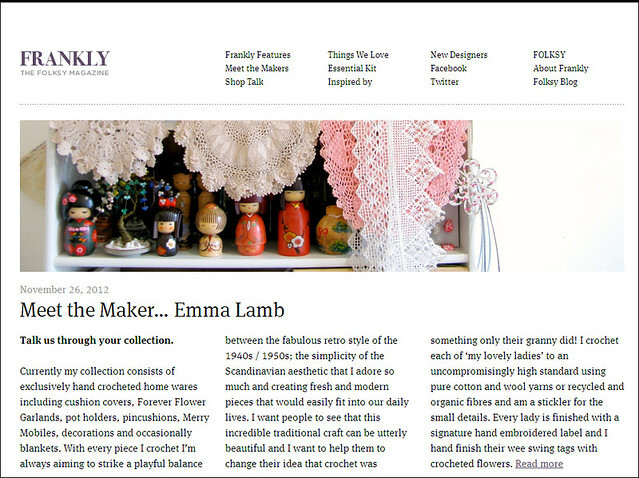 The wonderful folks over at Folksy have interviewed me as part of their 'Meet the Maker' series... yay! So if you're in need of a wee mid-afternoon (or mid-morning, depending where you are in the world!) break, brew a pot of tea and pop over for a wee read and find out my top tip for designer makers and what is at the top of my Folksy wish list this Christmas! Oh, and a huge thank you to the super lovely Emily Barnes over at Folksy for making this happen! Emma, the interview just served to increase my appreciation of you as an artist and also as a very generous person. Frances, thank you so much! Really, you couldn't have said anything more sincere, I appreciate your words hugely!